Binaural is an ﻿iOS app﻿, an Android app, and now a Web App which lets you make your own binaural beats and isochronic tones. 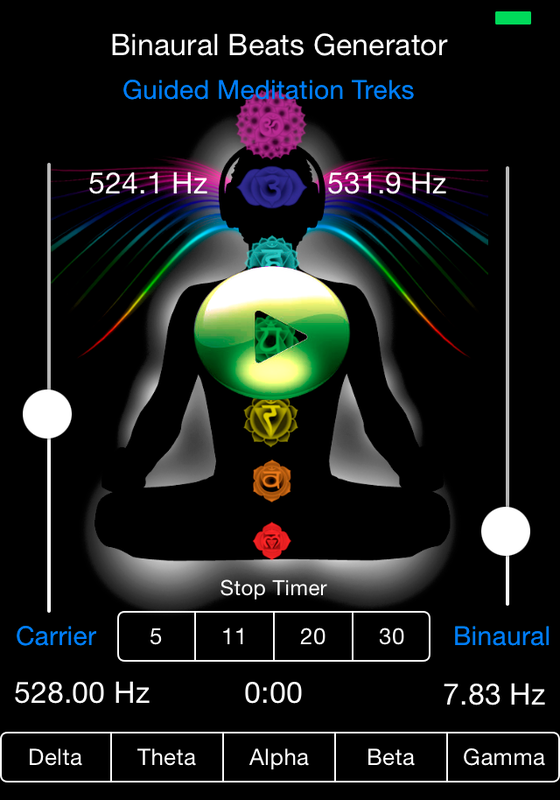 You select a carrier frequency and a binaural beats frequency (or isochronic tone frequency). From there, you can listen to the tone as long as you wish, or you can set a timer. 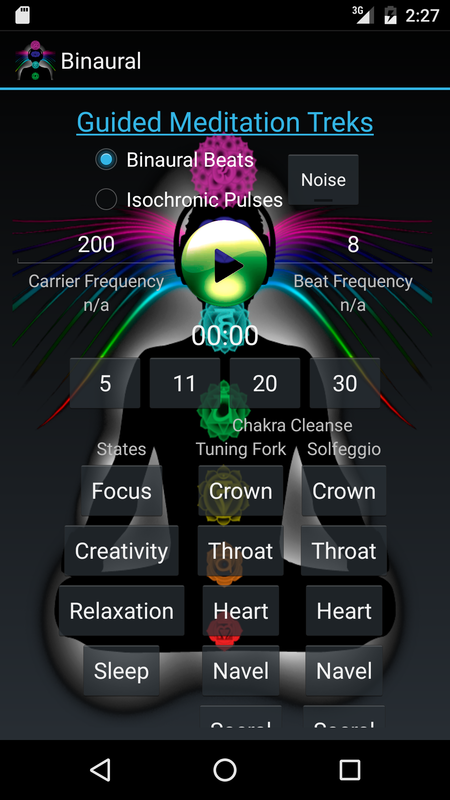 The app also has buttons at the bottom to limit the binaural beats/isochronic tones to within certain frequencies. Not sure what any of that means? Well, here's some background! Binaural beats are simply two sine waves played at two different frequencies into two different ears. Listening to binaural beats through headphones has been scientifically shown to alter a listener’s biofeedback of brain wave patterns known as EEG [1,2,7]. The theory is that the brain interprets the mathematical difference between the two waves and "synchronizes" with it. This "brain wave synchronization" or "brainwave entrainment" has shown great potential for human health [3,4,5,6]. For example, you can use these tones to help you relax, fall asleep, be creative, be focused, or even connect to higher levels of consciousness! Isochronic tones are similar to binaural beats, but they only use a single sine wave. This sine wave is turned on and off rapidly the same number of times as the frequency interpreted by the binaural beats. For example, at 8hz, the tone is turned on and off 8 times per second. Unlike binaural beats, isochronic tones do not require headphones and work if you are deaf in one ear. How do I use these tones? Binaural beats and Isochronic tones are frequency-specific. Certain frequencies relate to certain brain wave patterns and therefore certain feelings. Often, binaural beats are used within larger productions, such as the meditations offered by Guided Meditation Treks. For example, the CDs on this web site and their iOS application counterparts have the binaural beats programmed into the material. For example, if the meditation is trying to get you to focus on a visualization exercise, then the appropriate frequencies will be used within the meditation at that point in time. The frequencies often shift through the course of a meditation to continue you on your "trek." However, the Binuaral application lets you create your own frequencies. This gives you total freedom, but it also means it helps to know what you're doing. This page is meant to give you a reference so you can pick frequencies for states you which to achieve on your own, as well as learn about the concept. We can give you a fish with the CDs, but this app teaches you how to fish! iOS: You can either use the link provided at the top of the screen, or you can use the "swipe" gesture. The Android App also includes a Pink Noise button, which allows you to listen to a soothing noise track while the binaural beats play, or on its own. The android app also includes these presets. I'd love feedback in the comments on other frequencies that have worked for you, as well as your experience as to the efficacy of these default android frequencies. Sorry, iOS users, no presets yet. Arguably, this is more important than the carrier frequency. It is the frequency at which your brain "synchronizes." iOS: If you click on one of the buttons at the bottom of the screen, then the Binaural / Isochronic Frequency slider will be limited to that range. Otherwise, the slider operates across the entire range. You can also directly enter the frequency by tapping on the "Binaural" button. Select a frequency that is best for your situation. Then, simply sit with your eyes closed and your headphones on, and let the program do the rest! This is the frequency of the "root" tone. Android: Simply type in the carrier frequency into the text box on the left. iOS: As you slide the slider up, you'll notice that the pitch increases. Slide it down, and it decreases. Click on "Carrier" to directly enter the frequency. Scientific studies have shown that the lower frequencies are more effective for brainwave entrainment, so you might want to stick to those. For brain wave entrainment, the exact frequency you choose is not as important, but some schools of sound healing say that the carrier frequency has its own healing effects. There are less scientific studies to explore this, and the knowledge is mostly esoteric, but if you set intentions when setting the frequencies, it will definitely help! Those are some common tones used. This website has a big list of carrier frequencies that you might also want to explore. And, that's really all there is to it. Now, go create your own binaural beats! The iOS version requires you to select the frequencies to play (use the tables above to learn more), but android includes includes a series of buttons at the bottom of the screen, which are pre-programmed with specific tonal frequencies. You can click on one of the designated buttons and the tones will pre-populate and begin playing. Here are the presets, for reference. You can use these frequencies in the iOS app by directly typing them in. Here's an overview of binaural beats I presented at a workshop once. Huang, Tina L., Christine Charyton. "A comprehensive review of the psychological effects of brainwave entrainment." Altern Ther Health Med 14.5 (2008): 38-50. Padmanabhan, R., Hildreth, A. J. and Laws, D. (2005), A prospective, randomised, controlled study examining binaural beat audio and pre-operative anxiety in patients undergoing general anaesthesia for day case surgery. Anaesthesia, 60: 874–877. Siever, D. (2000). The rediscovery of audio-visual entrainment technology. If you like this app, check out my other apps on the app store as well! Send Feedback about the App!